The Zambian Road Safety Trust (ZRST) will host a commemoration of the National Day of Remembrance for Road Crash Victims in Zambia. The event will be commemorated tomorrow, February 7, 2015, from 14:00hrs at the Anglican Cathedral of the Holy Cross, in Lusaka. ZRST is the overseer and initiator of the National Day of Remembrance for Road Crash Victims in Zambia campaign. The National Day of Remembrance for Road Crash Victims will be commemorated annually on the 7th day of February and coincides with the Chibombo Post Bus accident. 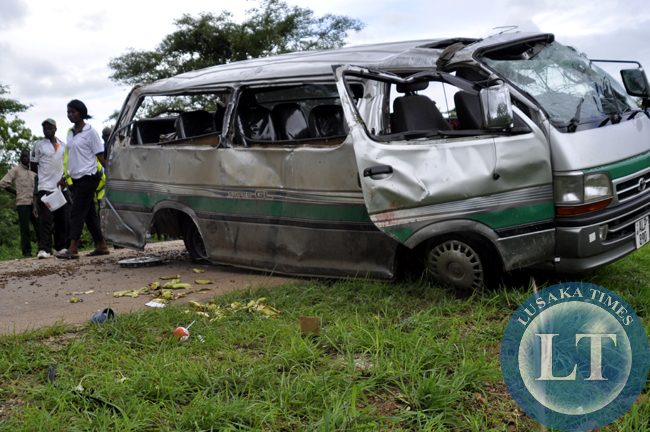 The Chibombo accident of February 7, 2013, is regarded as one of the worst horror road crashes after killing 51 people. The Commemoration of this day will serve as an important reminder that these fatalities and injuries are preventable. Chair of the Zambia Road Safety Trust, Daniel Mwamba, said the objective of the day is to raise awareness in Zambia and specifically among those with high-risk driving behaviours. Mr Mwamba said while road traffic deaths are counted in the year they occur, a family remains bereaved forever. He said the bereaved are not counted or included in road traffic injury data and many others remain deeply affected by the loss of their loved ones. Meanwhile, Oswald Chitete, a Gospel artiste from Ndola also known as Ausward, said It is a very important day as it is not only for those who are affected directly by losing their beloved ones. Chitete said it was the carelessness of the other driver who was rushing to feed his pigs that caused the Chibombo accident and deaths of many human lives. Chitete is among the relatives of the victims who will be attending the National Day of Remembrance for Road Crash Victims in Zambia. He lost his wife and daughter in the Chibombo accident. Instead of lobbying the government to avail more money to city councils to install traffic lights and pressure the RDA to incorporate value enginerring contracts innovative safety features in road contruction than just merely tar mark..eg One has to look at the double lane Great East Road that has no road markings on it after it was constructed yet its one of the busiest roads in the city. Prayer has to be followed by action. If we started working towards targets to make our roads safer, then we’ll get somewhere. From what I know about Zambian ways it’ll end with prayer. How can 51 people die at once? Have they changed the laws or implemented any road safety measures since then? Were families compensated for loss of life? Until we start acting instead of just praying people will continue dying and we’ll continue being a joke of a nation. A friend and brother in the Lord based in Ndola, a widower with no job remains confined to a wheel chair following the 7th February 2013 Chibombo accident. The man who was self-sustaining through farming has been reduced to a destitute. How I wish there was a system of supporting such victims. You, see, those who died and those who survived the accident with minor injuries were fortunate. Those who suffered serous injuries and became incapacitated are the most unfortunate. I do not mean to underplay the impact of loss of life on family members especially surviving spouses and children. The point I am making is that at a personal levelm death can be better than being crippled in a country without an adequate social security support system. on their vehicles as it is in Asia to record external environments,speed and other traffic on the road. This will force drivers to be more careful.